Set the mood just right this Halloween. You know what we mean. Sure, there are lots of ways to throw a spooky party, but there's one kind of specter we hold in high regard above all others. Skeletons! Sure, ghosts, goblins, and ghouls are all worthy for a good old-fashioned Halloween fright, but we the skeletons are the most frightening. So, you'll forgive us if we decorate all our costume parties with extra skeleton decor! If you feel the same way, well, then we're happy to have you as a customer. And we're happy to hook you up with tons of epic product selections. 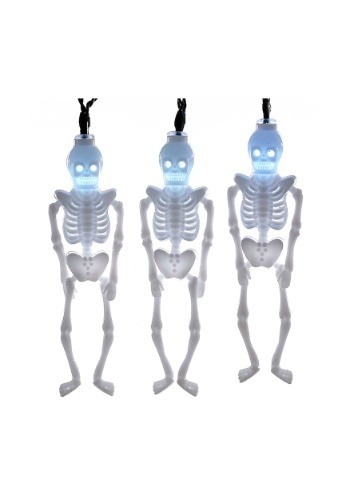 Take this Skeleton Party LED Light Set. With 10 spooky light up skeletons, a string of these will add the perfect ambiance to your themed decor. Of course, several strings of them strung together will change the scene altogether! You never know just what's going to happen Halloween night, when you have your candy ready to go and those trick-or-treaters start making their way to your door. Adding the right decor is sure to create the fondest (or most frightening!) memories. And, hint hint, we've got tons of other great product selections, too. From tabletop decorations to life-size replica skeletons, we've got designs and decor to outfit your whole house. So, go on, get spooky!